The artist Franz Seraph von Lenbach (1836-1904), Munich, by 1901 when exhibited. Mrs. H. von Schulthess-Bodmer, Schloss Au, Switzerland (see fig. 1), and by descent. M.J. Friedländer, 'Repertorium für Kunstwissenschaft', review of Ausstellung von Meisterwerken der Renaissance, etc., 24, 1901, p. 323. M.J. Friedänder, Altniederländische Malerei, XIV, Pieter Bruegel und Nachträge zu den Früheren Bänden, Berlin, 1937, p. 109, under Metsys. H.B. Wehle and M. Salinger, Metropolitan Museum of Art. A Catalogue of Early Flemish, Dutch and German Paintings, New York, 1947, pp. 107-8, under no. 32.100.47. 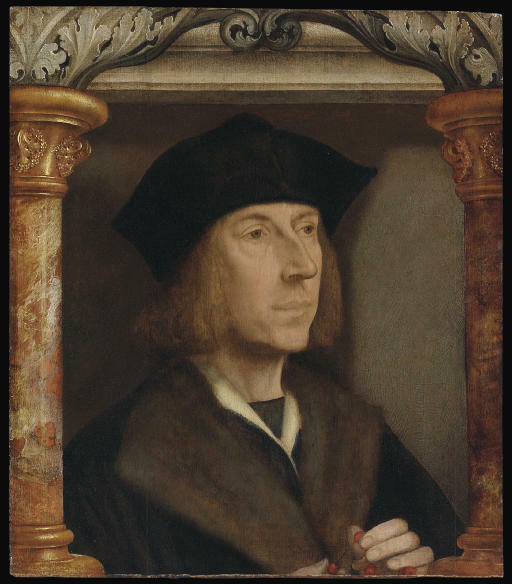 M.J. Friedländer, Early Netherlandish Painting, VII, Quentin Massys, comments and notes by H. Pauwels, trans. H. Norden, Leiden and Brussels, 1971, suppl. 169, p. 81, pl. 49. A. de Bosque, Quentin Metsys, Brussels, 1975, p. 237, under no. III.303. L. Silver, The Paintings of Quentin Massys with Catalogue Raisonné, Oxford, 1984, pp. 164, 221 under no. 32, p. 237, no. 60B. L. Campbell, Renaissance Portraits. European Portrait-Painting in the 14th, 15th and 16th Centuries, New Haven, 1990, pp. 34-6, fig. 43, under fig. 44. V. Sintobin, catalogue of the exhibition, From Van Eyck to Bruegel Early Netherlandish Painting in the Metropolitan Museum of Art, New York, 1998, pp. 187-8, under no. 38. Munich, Kunstausstellungsgebäude am Königsplatz, Ausstellung von Meisterwerken der Renaissance aus Privatbesitz, 3 June-30 September 1901, no. 62, as 'Niederländisch oder niederrheinisch (um 1500)'. New York, Metropolitan Museum of Art, From Van Eyck to Bruegel. Early Netherlandish Painting in the Metropolitan Museum of Art, 14 September 1998-3 January 1999, with no. 38. One of the greatest artists of the early Netherlandish period, Quinten Metsys has often been regarded, with justification, as the founder of the Antwerp shool of painting. Active in that city at the opening of the sixteenth century, when expanding trade was making the city the most important financial centre in the Netherlands, he is first recorded there in 1491 and became the leading artist in the flourishing painters' guild of St. Luke. His most celebrated works - two triptychs of The Holy Kinship and the Deposition, of 1509 and circa 1510 - are paintings on a large scale and show the artist at the height of his powers, a superb draughtsman and brilliant colourist with a sharp eye for depicting striking physiognomies. Metsys' portraits form an important aspect of his extant production. He numbered the great Erasmus among his patrons and sitters, and executed the diptych of Erasmus and Pieter Gillis that Erasmus was to give to Sir Thomas More. The commission placed the artist in the circle of leading, northern humanists: it was no wonder that Dürer was to visit him in 1520 during his trip to the Netherlands. Metsys was influenced by earlier Netherlandish masters - for instance Jan van Eyck - and by contemporary Italian art, notably that of Leonardo da Vinci. In this way Metsys' genius embraced and combined both home-grown tradition and contemporary, imported Italian styles that became the hallmark of the art of painting as practised in the great port on the Scheldt. The identity of the two sitters is unknown; most likely they were husband and wife and were members of the educated bourgeoisie. Lorne Campbell has written of the two paintings that 'characterisation is taken to an unusal degree of penetration in [the] two portraits...', whilst Silver noted that 'the appearance and execution of the Bodmer Man can be compared to the 1517 Karlsruhe Man [his no. 57], but his face is even more delicately and evenly modeled, with no dark shadows. Drawing of facial features has been epsecially meticulous for this portrait pair.' Metsys was presumably asked to emphasize the sitters' religiosity; so the man tells his rosary (a fairly recently introduced cult of the Virgin) and the woman is depicted holding an expensively illuminated Book of Hours. Campbell believes that the two pendants were originally depicted on one support which was later made into two panels. The measurements of the portraits in New York are more or less the same as that of the present picture; they are variously given as 47.4 x 41.4 cm. (Campbell) and 48.3 x 43.2 cm. (Sintobin). He observed that the support of the portrait in New York has been cut, with the original painted edge alone retained at the bottom. In the case of the present portrait there is a rebate on the reverse for a frame at all the edges (reduced at the top) but that on the right (when viewed from the front). Like the pendant in New York, the painted edge was respected at the bottom. The oak support (made up of two members) was probably bevelled after it had been cut. When joined together the two sitters would have appeared in an ornate arcade topped by a running pediment embellished with flat arches decorated with an acanthus leaf motif. Campbell thus describes the setting as 'the strange architecture...though it does not suggest any specific setting, it is luxurious in its materials and modish in its forms'. The Virgin and Child stand beneath an arch supported by similar porphyry-like columns in the picture in the Courtauld Institute Galleries (Silver, pl. 52), while in the picture by Metsys recently acquired by the Louvre, the Magdalen stands before a ledge on which stand two similar columns.